Greenville, Texas, is located less than 45 minutes east of Dallas on IH-30, a NAFTA trade route, making it a convenient gateway to the Dallas/Fort Worth Metroplex. 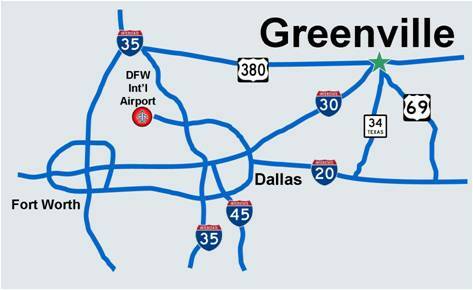 At the crossroads of IH-30, U.S Highways 380 and 69, Greenville also sits at the juncture of major rail lines. Every major railroad line can be accessed from Greenville, including BNSF, Kansas City Southern and Union Pacific. Shortline rail provideers DGNO and Blacklands Railroad serve the Greenville Industrial District and can handle virtually any size delivery. Well Connected . . .
Highway links to IH-35 & IH-45 are easily accessed via Dallas,and IH-20 via Texas Highway 34 South. These multiple transportation options make Greenville an ideal location for business and industry to manufacture and deliver products to key major markets. Airport Access . . . The Greenville Municipal Airport - Majors Field provides a safe and efficient aviation facility for Greenville and the surrounding region. The 8,000 ft. runway, with a total usable distance of 10,000 ft., will accommodate most modern jet aircraft and provides easy access for customers and clients travelling by corporate jet into the area. Close proximity to Dallas Love Field (61 Miles) and Dallas Fort Worth International Airport (71 Miles), provides easy access to domestic and international business travel. Plentiful Workforce . . .
Abundant Land . . . Thriving Business . . .
Companies already located and thriving in Greenville include L-3 Communications Mission Integration, Solvay Group, CNH Global, Fritz Industries, Masonite, Royal Oak, AB Mauri, West Rock, Innovation First International, International Grain and Cereal, FSTI, McKesson, Texas Book Company, OmniSYS, and many others. Greenville is the County Seat and largest city in Hunt County, with an estimated 2010 population of 26,600. It’s a community rich in heritage, yet positioned for growth as new highway systems and connections are being planned for the continuing explosion of growth in the North Texas Region. The citizens of Greenville enjoy a City with a progressive attitude which co-exists with a hometown atmosphere, creating a relaxed, yet upbeat lifestyle. A prime location, along with educational, cultural, medical, and retail opportunities and services, makes Greenville a highly desirable place to live and grow your company.